When looking through a selection of light bulbs, it can become confusing to compare different lamps to each other, but understanding bulb terms can help in finding the right lamps for the fixtures in a home or business. The following are the most basic terms to consider. Wattage and Voltage: Watts and volts are sometimes mistaken as measurements of light output. This comes from the familiarity of people with the incandescent light bulb, which has been the standard in lighting for decades. This long history has trained the average homeowner to think of lighting an area in terms of whether it needs a 40, 60, or 100-Watt bulb. 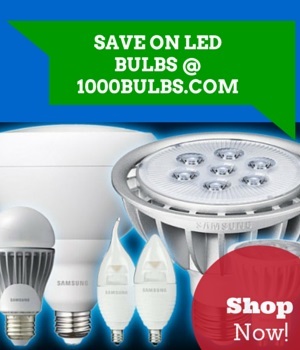 Even today, manufacturers of CFLs and LED light bulbs tend to stress the incandescent equivalent wattage rather than the actual, much lower wattage of the bulb. Lumens and Candlepower: As the lighting industry shifts away from incandescent lighting, it will become more and more important to focus on the actual light output of a bulb rather than how it compares to an incandescent light bulb. Lumens, also shown as lm, represent the actual amount of ambient light coming from a lamp. The higher the amount of Lumens, the more “lit up” a room will be. Candlepower, on the other hand (measured in candelas), is a unit of measurement that stands for the luminous intensity going in a specific direction from a light source. The latter, usually seen on reflector-type bulbs, is most important when the actual “punch” of the concentrated beam of light is more important than how much of an area it illuminates. Coloring Rendering Index (CRI) and Color Temperature (CCT): A bulb’s color rendering index is a representation of how well the lamp will reproduce colors. Lighting sources at the low end of the index, such as low-pressure sodium lamps (CRI 20-30) tend to wash out colors and are best used in commercial applications where accurate color rendering is not important. An incandescent or halogen light bulb, on the other hand, is considered to have a “perfect” CRI of 100. Linear fluorescents and compact fluorescents (CFLs) usually fall in the 80 to 90 range. While CRI represents how accurate a light source is, color temperature (represented in degrees Kelvin (K)) represents the character of the light source. At the low end, a color temperature of 2600-2700K creates a warm light like that seen in incandescent bulbs; a higher color temperature of 4100-5500K creates a whiter light like that most often seen in office buildings. Life Hours: Life hours represent the life expectancy of any given manufacturer’s light bulb. This, however, does not represent how long every bulb will last, but is rather the number of hours it took one-half of a batch of test lamps to burn out. Though this is a good indicator of a light bulb’s life, it is not a guarantee and should not be confused with a warranty. Do you have questions about these or other lighting terms? Ask us in a comment below or on Facebook, Twitter, LinkendIn, and Pinterest.